Welcome, everyone, to Day 17 of the 2013 Toy Advent Calendar! Trains have a strong association with Christmas. Back in the day they were the main means of moving stuff around the country, and just like now, more stuff gets moved around Christmas than any other time. Trains brought the mail (and thus, anything ordered from that other seasonal tradition, the Sears & Roebuck Catalog) and they'd also bring family members together for the holidays. Add to that the fact that toy trains were a major investment that most families could only splurge on as Christmas gifts, and you've got a recipe for a permanent pop culture connection. For us, Christmas means stores put more toys on the shelves. Good stores put out good toys, and bad stores put out bad toys - in other words, you can find brand name toys at the Big Three, and an increased selection of cheap knockoffs at Market Six. Knockoffs like the Engrish-ly named Steel Divine. Remember the Robots in Disguise Rail Racer trio? Remember how each of the robots' heads looked like a smaller version of some feature on their altmode? Of course you don't, nobody's thought about those characters in years. But they did, and Steel Divine does, too. He has a faceplate, but his forehead looks like the front end of a steam boiler. This is a knockoff, so it's understandable that the body is blocky and unprofessional. It's like a Generation 1 design (though if it's based on a real TF, it's not one I've ever seen before). [It's not - this is "Koutetsu Busou Advenger" from Ougon Yuusha Goldran, and was designed by famed Gundam creator Kunio Okawara --ed.] 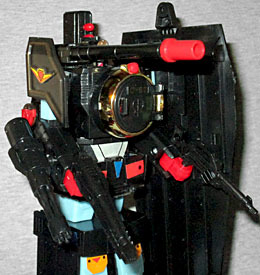 He's basically just a series of rectangles with a few vehicle pieces scattered around, like many G1 toys. The articulation is pretty low as well: he has some joints in the arms - the elbows are both swivels and hinges, unexpectedly - but that's really all. Everything else is incidental. To make up for that, he comes with a surprising amount of weaponry. There's a swivelling cannon over one shoulder and a tower of missiles over the other, plus four more missiles in each leg. 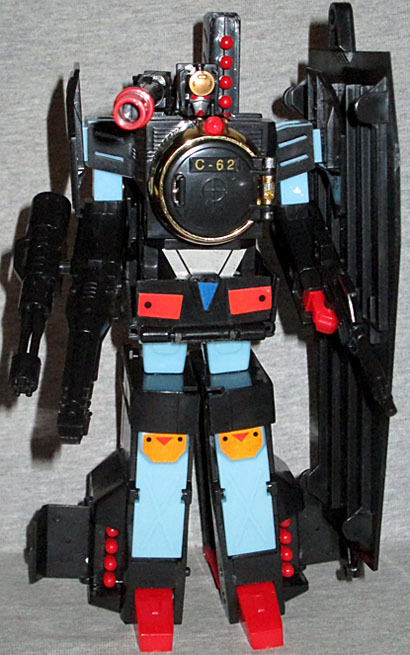 His chest opens to reveal a fan blade/propeller that is supposed to be able to launch, but that feature hasn't been retained here. 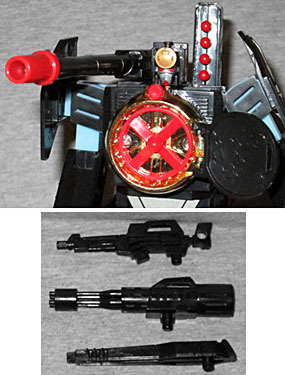 He's armed with three different guns that can be held in his hands or plugged into the outside of his forearms - a Gatling gun, a rifle, and some kind of laser blaster. Finally, there's a shield nearly large enough to protect him from head to toe. Changing Steel Divine into a train is a bit more complicated than you might expect. Nothing too crazy - just some unexpected swivelling in the chest - but enough to make it fun. The robot's waist plate turns into part of the roof, and falls off way too easily. For a knockoff, Steel Divine makes a really nice train engine. For one thing, it's a steam locomotive, not another freaking bullet train. We know it's steam because the panels on the robot's legs flip around to reveal coal in the tender, and you don't need to burn fuel in a diesel engine. The coupling rods are separate pieces attached to the outside of the wheels, adding some realistic depth, while the windows on the cab are all just hastily applied stickers. There are some problems, however. The most egregious is the missiles that point over the robot's shoulder end up lower than the wheels on the train, so they drag on the ground while the whole thing leans to the side. 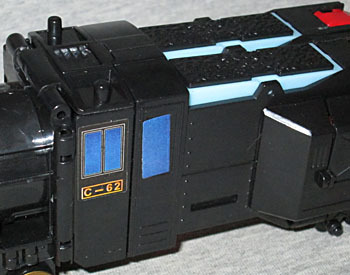 The back of the comically oversized blister card implies that the guns plug into the bottom of the train, but they don't (they can be stored inside, however). And as mentioned before, part of the roof perpetually falls off, too. When you buy a knockoff, you get what you pay for. The shield can be towed behind the engine like some sort of mobile platform. There are two tabs where (in theory) something could be plugged on, but who knows what that something could be? 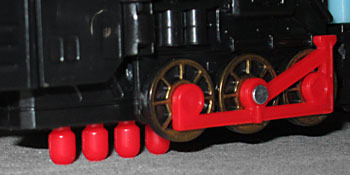 A golden hook folds out from beneath the train, fitting perfectly into the hole at the top of the shield (the shield itself has another hook at the bottom, if case you want to chain them). I'm always complaining that there aren't enough train Transformers - especially not good old-fashioned ones. Steel Divine may not be a real Transformer, but he does show that there's potential in retro locomotive designs, not just fancy futuristic ones.